Breakfast at the Regency Cafe, followed by the Christmas party organised by one of the baby groups Erika and Chie go to. Then into the centre in the afternoon for some shopping and ramen for lunch at Shoryu. Me and Erika in a festive Regency Cafe. Me, Erika and my breakfast. 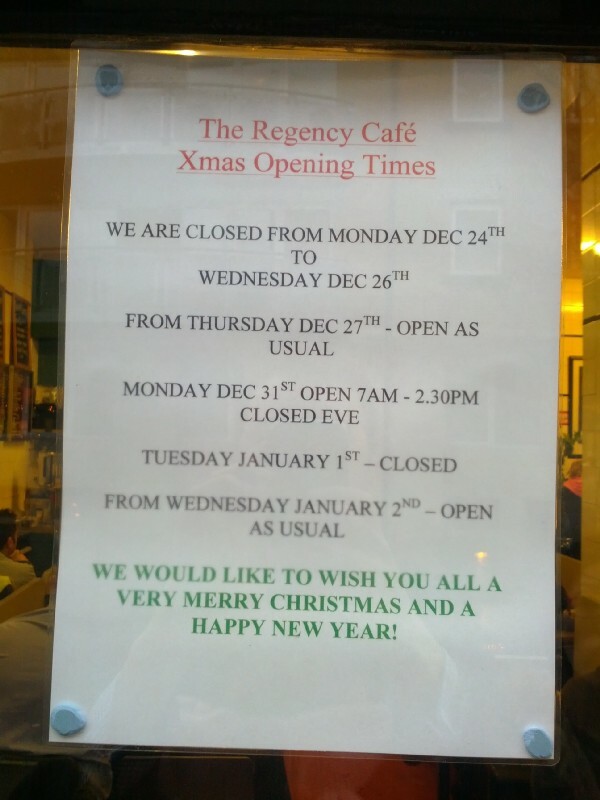 I took a picture of the Regency Cafe opening times over Christmas as Mum had asked about this. At the Christmas party now - there's the entertainer playing songs to entertain the kids. ...and now he's making balloons. 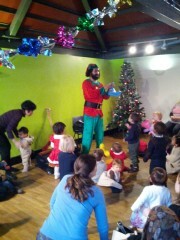 Erika playing pass the parcel. Erika meets Santa Claus for the first time. Cathy (who runs the baby massage class Chie and Erika go to), with Erika and Chie. Chie and Erika outside the Japanese embassy where we picked up her passport today. Shoryu, a new ramen place on Lower Regents Street. My "natural" ramen - the vegetarian option.